Finished the last two tags in my series of six (pop back a day or two to see the other posts and all the tags in the series), and now working on the book that will hold them. It’s no special construction, but I am trying something with fonts that I have high hopes for. But then I always do start out with HIGH HOPES, it’s just whether or not they are fulfilled that is the question right until the bitter end! 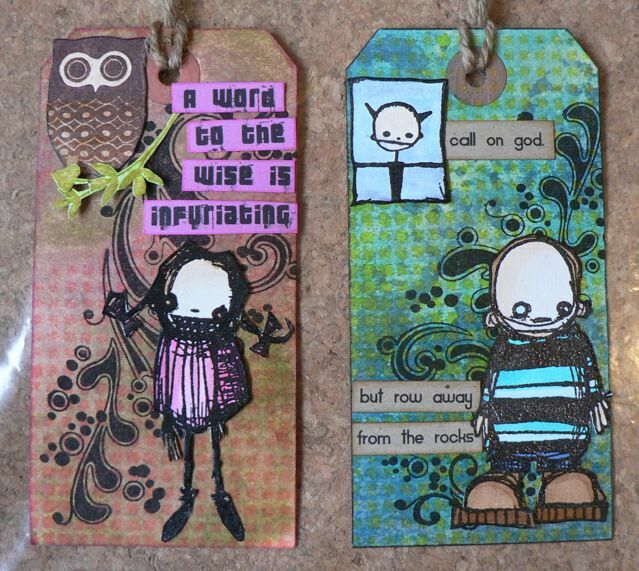 The swirls are Inkadinkadoo, the owl is Tim Holtz, and the little vine is from a set of stamps designed by Debbie70 (I think!) for a class maybe at a ScrapManic crop, maybe 6 or 7 years ago? I have no idea at this point, but they are still in their little CD case holder and I have a layout SOMEWHERE that used them, but the facts are lost in my head someplace. Anyone reading this have any idea? My desk looks quite tidy today, but am still working on my TV tray. That background is what I substituted for my craft sheet, as that is on the ironing board, with the fabric, for the iPad cover sewing and I really didn’t want to have to keep trotting back and forth and worrying if I had cleaned it completely of ink before I used it to iron fusible web! It’s a cork floor tile in a plastic bag. It works great for the smearing and misting of the inks, and has great “give” but is still quite firm for stamping, but I do have to take care not to use my heat gun over it – that could be a disaster! I may just make it a permanent fixture on my desk, it works so well. Categories: stamping, WOYWW | Tags: folders, stamps, tags | Permalink. Great tip on the cork board. I will have to try it! Just love these tags, they are just so…in your face!! grrrrrungy!! Thanks for sharing these – they’re great, and so FUNNY!! 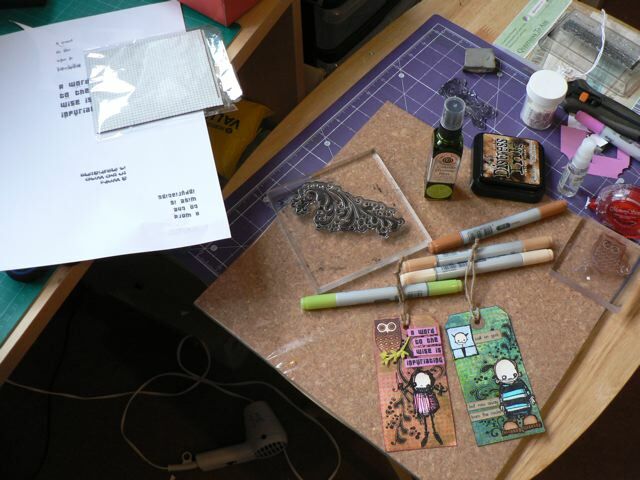 Just love the Stampotiqued tags, fab fab fab! These tags are adorable. I love the sayings on them. Have a fun and artful WOYWW. Thanks for letting me snoop. Great to see you WOYWWing MA … I really love all the tags and cannot wait to see the book. I love the images on your tags. Aww the tags are great!! AMAZING tags…I LOVE LOVE LOVE them! Ya know I love the tag series, they are a delight to behold; the words are just marvellous. Hope you’ve enjoyed doing them as much as I have seeing them! The tile-in-a-bag is a genius idea. Slap a patent on it! So happy you linked today! I love those swirls. They look really cool on the tags. Traci made your salmon recipe and loved it! Said it is a “keeper” that she will be making again and said “thanks”!